In the fast moving world of beauty, it can be hard for brands to stand out. 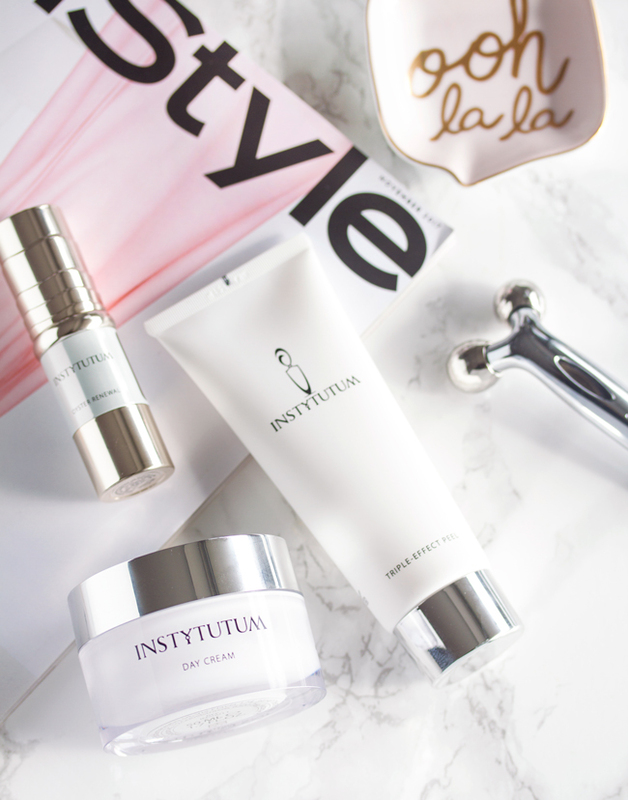 Instytutum is an innovative luxury Swiss skincare brand built on a passion for scientific and dermatological advancements and a belief in the restorative power of nature. Based on the work and research of Dr. Natalia Derkach, Instytutum products are infused with a specially curated water that has been purified through a five-step filtration process and formulated using only the most exceptional of ingredients. The brands believe in a holistic approach to skin care and their products which contain a a combination of cosmeceutical ingredients, patented stem cells and biomimetic textures have been clinically tested to ensure scientifically-proven efficacy and are designed to support a healthy lifestyle. Instytutum strives to make an impact on the world as well as your skin. The company funds fund a clean water initiative in partnership with Waves For Water to provides clean water filters to impoverished communities all over the world. Instytutum Day Cream is billed as multi-function anti-aging day cream that improves and restores moisture, firms and increases skin elasticity. It does so with a powerful formula that combines retinol, hyaluronic acid and vitamin E with BerryFlux Vita and CellPulse to smooth skin texture while visibly minimizing the appearance of fine lines and wrinkles. Natural collagen and hyaluronic levels are boosted, making the skin look noticeably younger. This product is appropriate for all skin types. Collagen Synthesis Stimulating Peptide mimics the body’s own mechanism to produce collagen, working to diminish wrinkles to firm and plump skin. Second Skin Marigel works to form a protective layer on the skin surface, diminishing transepidermal water loss and facilitate delivery of actives. Lifting Peptide works to fight against skin slackening, stimulates elastin synthesis and provides a visible face contour lifting effect. ProVitamin B5 provides anti-inflammatory properties to protect, restore and maintain skin moisture levels. Vitamin E reduces signs of aging and delays premature aging. Aids in keeping skin plump while promoting tissue firmness and overall glow. CellPulse enhances skin structure by diminishing loss of lipids and improving water and glycerol transport in the epidermis. Berry Flux Vita Extract of Cultured Raspberry Stem Cells contain antioxidant properties that work to improve skin’s own moisturizing capacity and elasticity while increasing hyaluronic acid content. Retinol is a powerful wrinkle fighter that works to exfoliates surface skin cells, restoring damaged skin and improve barrier functions while stimulating the rejuvenation process and increasing collagen production. 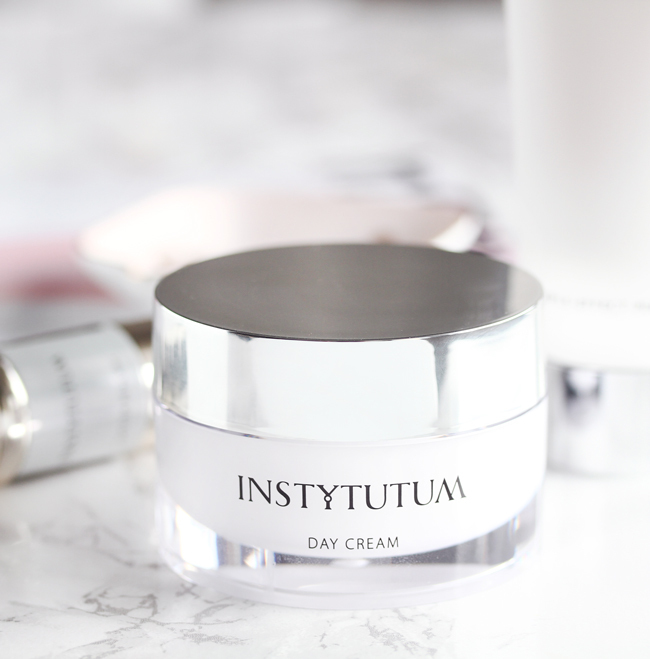 Instytutum Day Cream is housed in a minimalist plastic jar. A spatula is included to dispense the product. The cream is white in color with a barely perceptible scent. It has a velvety texture which gives way to a silky lightweight feel on the skin as it sinks in readily upon application. My dry skin tends to act up when it's cold and this cream has been enough to keep my face hydrated for the entire day. I haven't experienced any reactions, dryness or peeling. Since it absorbs to a smooth satin finish, this cream wears well under makeup. There is really nothing I don't like about this cream but I will say that I would like it even better if it had SPF. 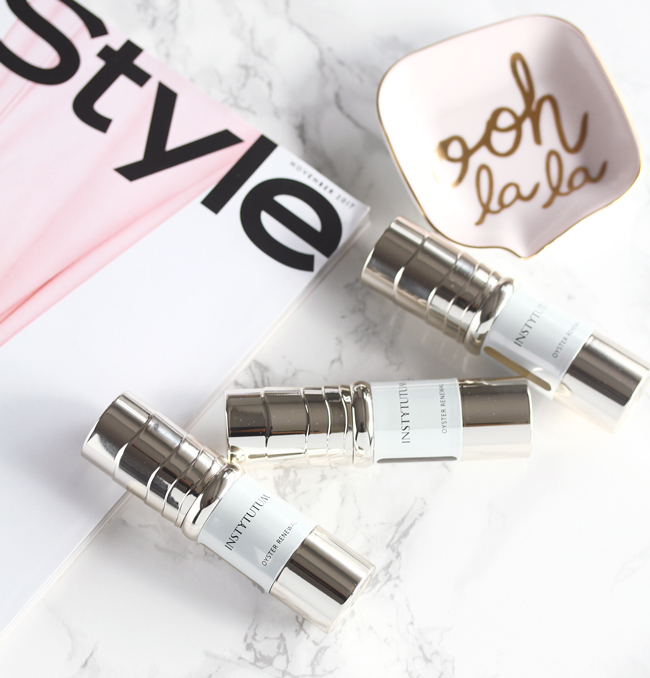 Instytutum Oyster Renewal Serum is a powerful remodelling, firming and lifting treatment that combines Instystum's exclusive Marine Mineral Complex and Pearl Oyster Complex to rejuvenate skin and boost collagen production for a radiant complexion. This treatment consists of a series of three dual-phase serums that provide a dose of high-performance actives per application. Upon activation, the complex mixture works to increase cell renewal, diminish wrinkles, improve skin elasticity and smoothness. This product is appropriate for all skin types. Pearl Oyster Complex helps to restore skin tone and skin barrier strength. Osmo Regulating Active made up of an optimal combination of four natural ingredients (citrus honey, pectin, trimethylglycine and phospholipids) provides unparalleled hydration. Saccharide Isomerate helps skin retain moisture, reducing dryness and increasing softness. Resculpting Peptide firms skin while fighting slackening, improves collagen development and hyaluronic acid production. Dermagenic derived from wakame algae, rich in nutrients, calcium and amino acids, it provides smoother and firmer skin. Bionymph Peptide derived from plant stem cells provides 360° anti-aging benefits by significantly decreasing the production of free radicals, regulating the activity of DNA. Ocean Placenta Extracts from a concentrate of sea grass provide collagen boosting and revitalizing benefits, promoting brightness and radiance. Sodium Hyaluronate has strong moisturizing and film-forming properties that help to preserve the most important characteristics of youthful, healthy skin, such as suppleness, elasticity and tone. Marine Mineral Complex encourages elasticity enhancing skin radiance. Regenerative Plant Actives extracted from amino acid rich, GMO-free soybeans boost cell metabolism by improving skin oxygenation and stimulating cellular renewal. Divine Extract is a revitalizing blend of mineral salts, particularly trace elements from calcareous sea sediments and oyster shells that is indispensable for maintaining and restoring the skin's energy. A three bottle supply of Instytutum Oyster Renewal Serum is packaged in a box. Since this serum contains high-performance, time-sensitive active ingredients, once activated, the serum should be used within one month for optimal efficacy. The serum is dispensed via a sleek and elegant pump bottle. The ingredients are activated by twisting the base to the right and shaking well before each application on cleansed skin. Instytutum recommends two drops per facial application which I think is about right. The serum is clear in appearance with a watery consistency and no discernible scent. It is slightly cooling upon contact and absorbs readily into the skin with a soothing feel. While I didn't notice any immediate effects, after a week of using this serum, my skin felt softer, smoother and my skintone appeared visibly more even and brightened. The texture of my skin as well as my pores also appeared more refined. I suspended usage of all my other serums while testing this so I know it had to be this product. To be honest I was almost hoping this serum wouldn't work so well since it is $$$ but this is a legitimate transformative treatment. Each bottle lasts about two and half weeks. Instytutum Triple Effect Peel is thus named as it is a triple-action microdermabrasion product that uses micropolishing particles, salicylic acid and enzymes to that deeply exfoliate and polish the skin to generate skin cell turnover and transform skin texture. For best results use this peel 1-2 times a week. This product is appropriate for all skin types. Usage of a high SPF is recommended since it does contains AHA's. Fine Exfoliating Particles work to remove impurities and dead skin cells, stimulating cell turnover. Second Skin Marigel forms a protective layer on the skin surface, diminishing transepidermal water loss helping to progressively deliver actives. Chamomile Extract soothes and moisturizes while repairing damaged skin. Allantoin is an excellent anti-irritant that improves healing processes and soothes the skin. Botanical Soothing Protector is a synergic combination of three plants used in traditional Chinese medicine that is designed to reinforce the skin’s natural defense system, this active effectively increases protection against oxidative stress, preventing premature skin aging. Gentle Keratolytic Complex effectively exfoliates the skin by combining potent acacia polysaccharides and smoothing salicylic acid. Papain is an enzyme derived from papaya that dissolves keratin, smoothing and softening the skin’s epidermis. 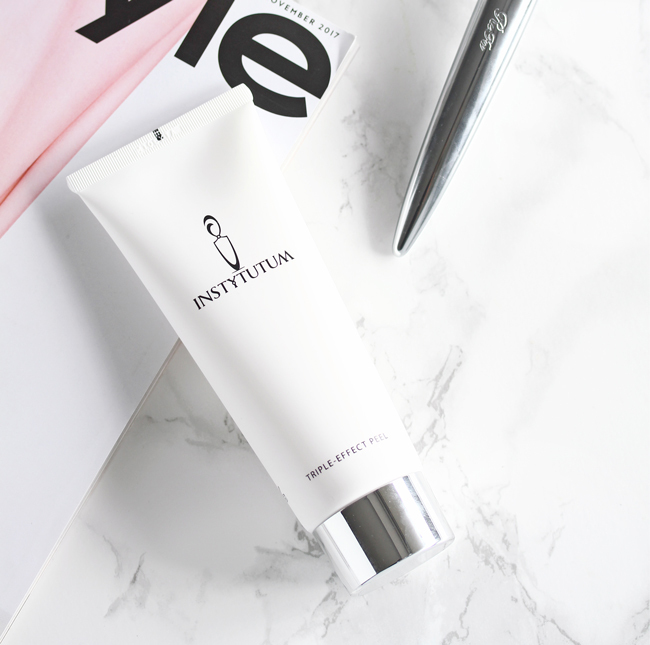 Instytutum Triple Effect Peel is a physical exfoliator that is packaged in a plastic tube with a twist off metal cap. The product has a cream meets gel-like consistency with a faint slightly floral scent that's not particularly offensive or pleasant. I generally like to space out my exfoliation processes so I've been using this once a week. This recommended application for this product is to massage onto clean moist skin and leave on for 2 - 5 minutes. It can be polished onto dry skin and left on for 3 -5 minutes if a stronger effect is desired. Sensitive skin types can use this as a mask without the polishing. I have used it on moist skin and as a mask. Even though my skin can be sensitive, I didn't have any issues with the fine exfoliating particles as they are quite gentle. I have used products with professional grade crystals that you have take a very light hand with and that is not a worry with this peel as it isn't abrasive at all. While it feels gentle, it does work. Immediately afterwards, my skin would feel extra soft and smooth and my skincare products sank in better. And my complexion would also look better than usual the next morning. This is an effective resurfacing peel treatment that works to refresh the skin and remove dead skin cells. I also had my husband try this and it works as well for his oily skin as it does for my dry skin. He didn't complain that it was scratchy and was quite amazed by how smooth his face felt. Overall I was impressed with these Instytutum products for the way they combine quality natural ingredients with scientific innovation. But most importantly, they work as they claim. My skin has seriously become brighter and clearer since I've been on the regimen. 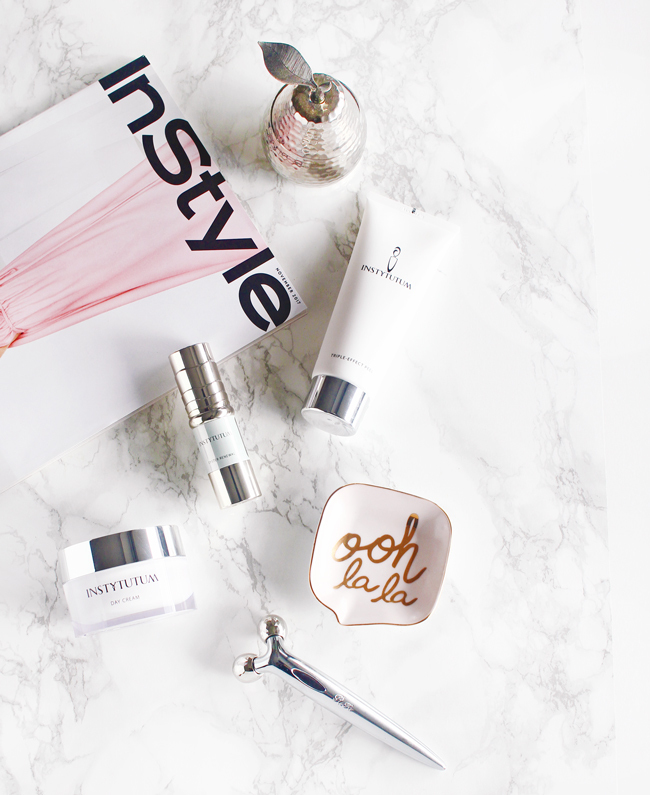 The Instytutum Oyster Renewal Serum is a serious game changer! Another product I tried and am a big fan of are the Instytutum Flawless Pads. Infused with glycolic, lactic, citric, hyaluronic and salicylic acids as well as provitamin B5 and vitamin PP, these peel pads are gentle and easy to use and have helped me to achieve a smoother and brighter complexion. What do you think about these products? Is there one you'd want to try? 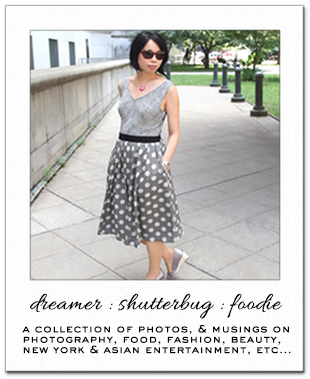 Disclosure: This post features complimentary products received for editorial consideration. All opinions are my own. For more details about my product review policy, copyright, and information about affiliate links, please refer to the Policies page of this blog. You know by now that I am a huge fan of the brand Instytutum, and especially the Triple Effect Peel is among my favorites. The Oyster Renewal Serum is one that I never would have picked due to the price, but hearing that t gets your sign of approval... I am tempted. It so true the so many products come out so fast to try, It is hard to stand out. I like products that do the job those are a keeper this sounds like one of those products. Thanks for sharing it with us. All these products great! I'm all for maintaining healthy and glowing skin. Thanks for the reviews Rowena! Have a wonderful week! Great products! Thanks for sharing!! I love the Day Cream and it's so hydrating despite being having a lightweight texture. I didn't even look at the serum because it's so crazy expensive but I will after reading your review. Never heard of this brand, but the renewal serum bottles are really nice. The renewal serum sounds fabulous! The Serum sounds really effective - ahh totally with you on wishing some products wouldn't work SO well to avoid having to keep repurchasing £££ (although I'm sure we both know that makes no sense, haha!). Once again, adoring your product photography Rowena! Oooo these products sound amazing though a wee bit out of my price range. But I love that they give back to a clean water campaign. I wish more companies did things like this. I'm such a big fan of their products and have been curious about their serums, especially the oyster serum which I haven't read any reviews of until now! So glad to hear that it works well, especially considering the price. One of these days I'll have to try it for myself, though my wallet might cry if I end up loving it too! That serum sounds amazing. I definitely want to give that a go! I've just splurged on some Dr Dennis Gross products so once I've used them up (because I spent far too many $$$$ to not give it a go hahaha!) I'm going to look into this brand some more. I become more and more impressed with each review Rowena! What a great brand! I will have to try their products. The results sound so impressive.